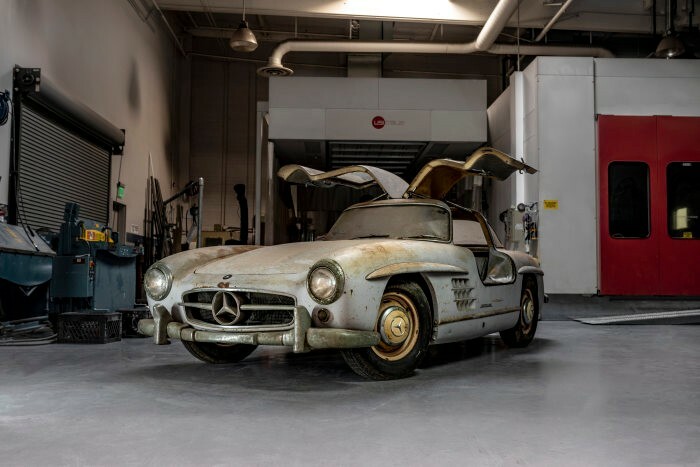 Amelia Island Concours d’Elegance 2019: Mercedes-Benz 300 SL "Gullwing" twins in Florida - The "Ockhuisen" Mercedes-Benz Collection. The finest in automotive classics on a decorated lawn directly off the Atlantic coast: welcome to the Amelia Island Concours d’Elegance in Florida. This year marks the event’s 24th anniversary (7 to 10 March 2019). At the Concours Field, two vintage Mercedes-Benz 300 SL “Gullwing” (W 198) models with successive chassis numbers will have their own exhibition area. 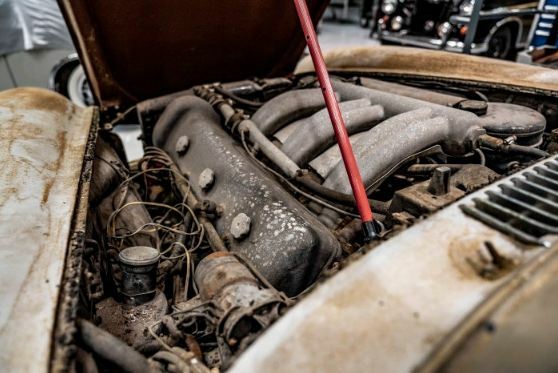 The vehicle bearing number 43 will be presented in “barn find” condition, while vehicle number 44 has been completely restored by Mercedes-Benz Classic. Other highlights of the brand on display on Amelia Island include the Vision EQ Silver Arrow showcar and replicas of the 300 SEL 6.8 racing touring car and 280 GE “Paris-Dakar”. 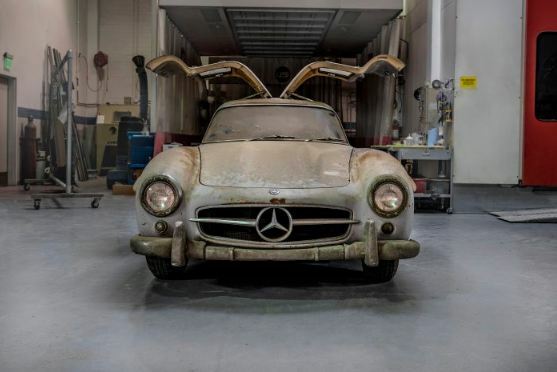 Chassis number 43: the coupé is in “barn find” condition as found by Mercedes-Benz Classic in a garage at the end of 2018. 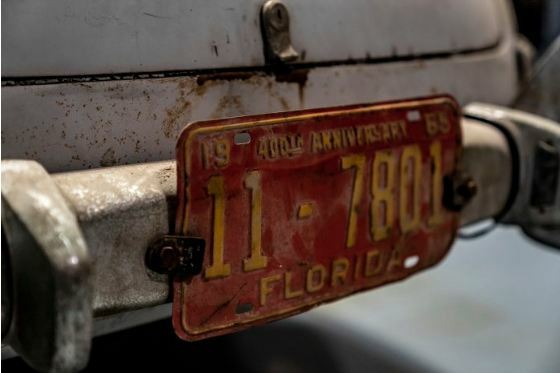 It was originally shipped to Miami in 1954 and was only registered for ten years. The vehicle is completely original. 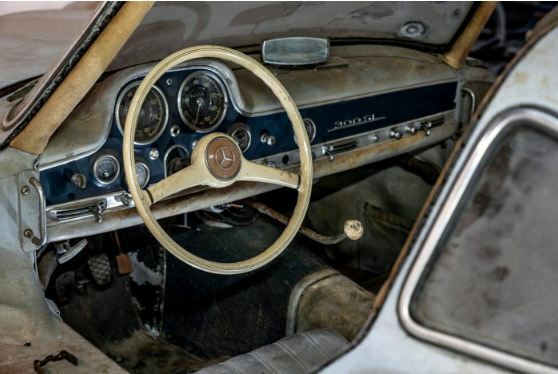 The body, for example, the glass components, the grey leather interior, the drivetrain, the wheels — even the “Englebert Competition” tyres are all as you would have found them on the car decades ago. 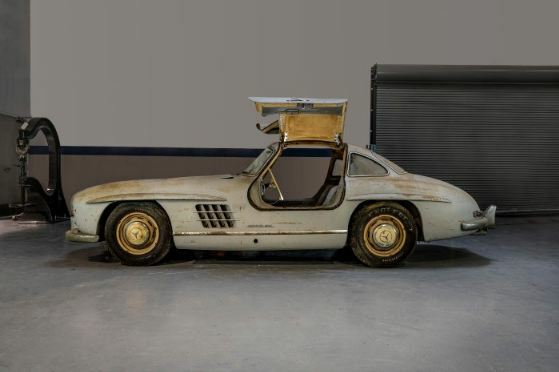 Mercedes-Benz 300 SL “Gullwing” (W 198), chassis number 43, in “barn find” condition. 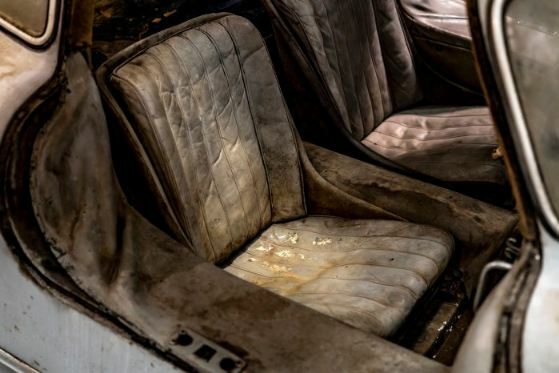 This is the exact condition in which Mercedes-Benz Classic found the vehicle in 2018. The only modification was to the body finish. Originally painted mid blue, the coupé was at some point sanded down and primed. What most likely happened was that the vehicle was taken out of service in the mid-1960s to be repainted and had been prepped, but never actually repainted. which will be parked directly at the entrance to the event grounds. Presented last year, the showcar is a tribute to the successful record-breaking W 125 model from 1937. Designed as an electric vehicle, the silent Silver Arrow has 550 kW or 750 hp. 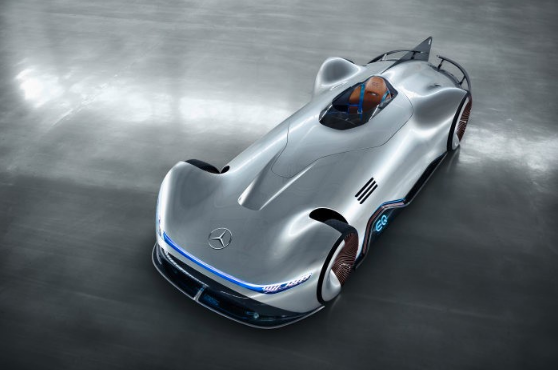 The Vision EQ Silver Arrow also quite literally drives into the automotive future boasting its myriad of other features, such as those found on the interior. (combined fuel consumption: 11.3-9.1 l/100 km; combined CO2 emissions: 257-209 g/km*), a Mercedes-Benz 300 SEL 6.8 AMG will also be showcased. The replica of the racing touring car from 1971, which won a complete surprise class victory and second place in the overall classification in its very first competition at the 24 Hours of Spa (Belgium), is something of an ancestor to the Mercedes-AMG GT 4-door coupé. 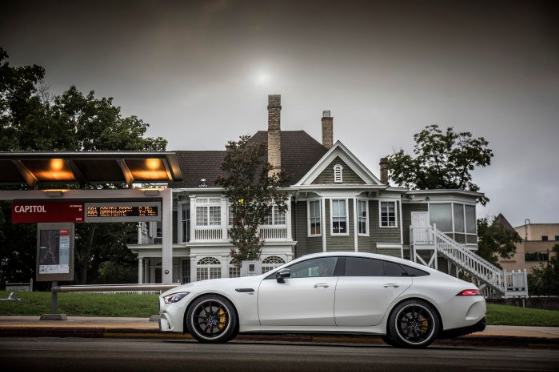 Another vehicle developed independently by Mercedes-AMG, it combines unique design, high comfort levels and class-leading sports car technology with an athletic, four-door fastback layout. As a result, it offers more space and greater practicality. This year, the Amelia Island Concours d’Elegance will be honouring racing and rally driver Jacky Ickx with numerous vehicles on exhibition. One of these is the faithful replica of the Mercedes-Benz 280 GE that the motorsport legend used to win the 1983 Paris-Dakar long-distance rally together with his co-driver Claude Brasseur. The Amelia Island Concours d’Elegance is one of the most glamorous events for classic automobiles and has a lot to offer. Each year, the finest cars from all over the world are parked on a well-groomed lawn directly off the Atlantic coast and judged in different categories by a team of jurors. A “Best of Show” award is one of the most prestigious available. 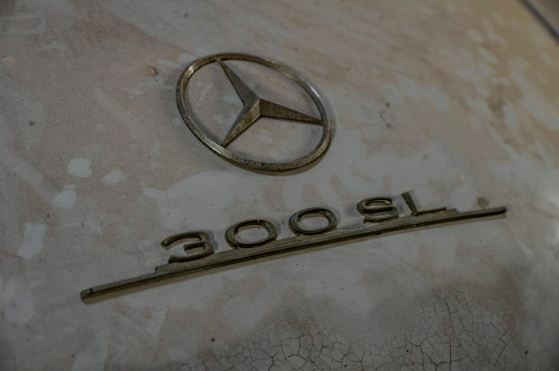 This year, there will be a separate classification for the Mercedes-Benz 500 K and 540 K (W 29). These outstanding models from the 1930s are among the most sought-after collectors’ vehicles ever.